RazersEdge and I took off in an MH-6 flying due south to the coast off of Tiberia. From there we went due east to the archipelagos and from there due north to our destination, Pita. We landed south 750 meters off of the city, just outside of the grey zone and proceeded on foot. We arrived at the southern docks and spotted a four man patrol. We took cover and let the team pass. From there we followed the coast up to a concealed position north, north east of the airfield. We spotted lots of infantry on the west side of the airfield and a Shilka close, within 100 meters of our position. I hit my belly and crawled up to the Shilka and placed a satchel timer for 15 minutes. I crawled back to Razer's position and we began our approach on the hangers. Here is a screenshot I took just before our heist at the second marked blue position. We proceeded to waypoint one and then to the second waypoint spotting four infantry at the backside of the first hanger. Razer and I took them out with our silenced M4s keeping our element of stealth. We then spotted a UAZ and BRDM-2 parked just outside the hangers blocking our path to the SU-34. Razer took a rocket shot and destroyed the BRDM as I opened fire and took out both the driver and gunner of the UAZ. I finally took out the pilot standing guard over the SU-34. We ignored waypoint three and made a 25 meter dash to the jet. Razer and I both quickly entered the SU-34 and I started up the engines. I flew as fast as I could off the runway and flew north (in the dark) to land on the island of Antigua. The operation took us just short of 43 minutes with zero friendly casualties and nine dead Russians, one destroyed UAZ, and one destroyed BRDM-2, oh and a captured SU-34! Below is a screenie of our first prize and the ammo statistics. ...which Razer then used efficiently in an air attack on Pita. The second part of the operation took us just about 39 minutes (from departure from main base to SU-34 touchdown) with no rounds fired and the element of stealth kept the entire time until we had our hands on the vehicles. Last edited by NoDebate; 07-11-2007, 01:10 AM. Yup, that was one heck of a wild ride. Our second time going in we didn't fire a single shot. We managed to keep our element of stealth. Actually what he neglects to put in is that once he took off for antigua with the SU-34 on the second run, I lit up 6 armored vehicles, a mix of BRDMs, BMPs, and T-72s, and 4 UAZs, in Pita before meeting up for rendezvous at Antigua. After we got back to base we made use of the KA-50, striking targets in Ortego, and Corazol. Using the KA-50 we stole, I lit up another 8 armored vehicles and 6 UAZs, on the north and south shores of Corazol. We completely cleared Corazol of AAA as well. 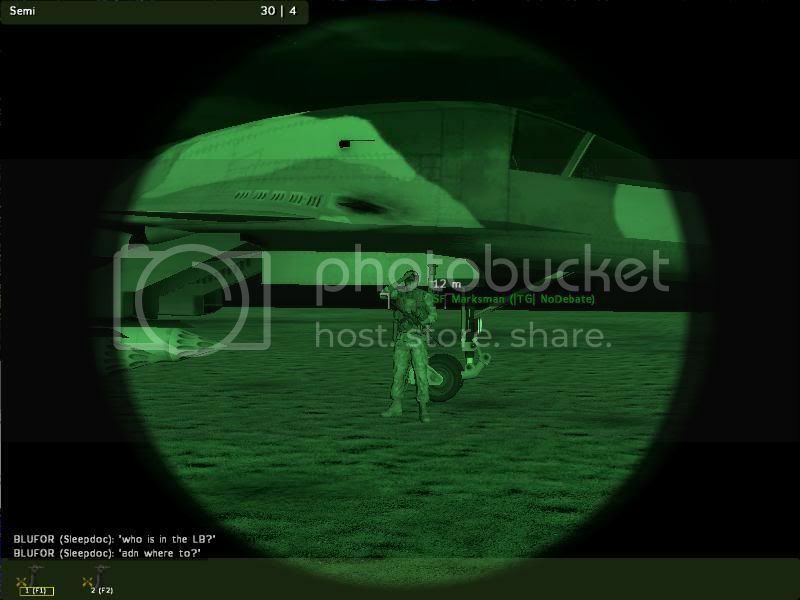 Here is a lovely picture of NoDebate standing in front of the first SU-34 we captured. Even though I really enjoyed that AAR, and I would have enjoyed playing right beside you for all of that, we have to get a handle on flying all over the island. This "activates" all the AI in those towns, which kills our server. Just keep this in mind guys. Oh and we definitely could've used a third man. I marked on the map the lighthouse which would have made a perfect vantage point for over watch. Razer and I will definitely attempt this again but perhaps this time shortly before dawn or shortly after sunset with a third person!